We offer high and fine quality Green Millet (Bajara) to our most reliable customers which are situated all round the nation. 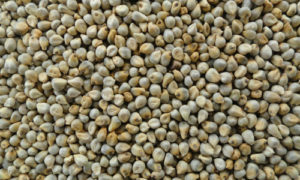 These Millet (Bajara) are available at market leading as well as at competitive prices. Green Millet is one of the oldest foods from the family of millets very well known to humans and possibly the first cereal grain to be used for domestic purposes. Green Millet has been used in countries like Africa and India as a staple food for thousands of years. Millet is very rich in fat than wheat, thus a good source of nutritional content and can be fermented to make alcoholic beverages. The finest quality millet is free from any foul smell and highly suitable for poultry feeding as well. We export millet with premium packing that saves its nutritional values for longer period of time.